It’s time once again for my annual review of the year in ed-tech. This is the sixth year I’ve done so. It’s a fairly massive undertaking – Gates-Foundation-free research, a rarity in ed-tech – which means I have to start thinking about this project long before the end-of-the-year. That always makes me nervous that I’ll leave something out – that something “big” will happen in December that’ll change everything. Or at least, something that’ll change the focus of my analysis. I’m not sure why I worry. As education technology entrepreneurs and investors and politicians like to remind us, education has not changed in hundreds of years, right?. Or at least, it never ever changed until education technology entrepreneurs and investors came along to “disrupt” things. LOL. #thanksSiliconValley. But looking back on the last five years of my “Top Ed-Tech Trends,” it does seem as though very little has changed. (Indeed, this series is beginning to feel like the Horizon Report, except instead of predicting what’s “on the horizon,” I’m always observing “the history of the future” of education by looking at the recent past. Many of the things I have written about previously – and will write about again this year – remain the same. If nothing else, ed-tech remains incredibly political, and venture capitalists continue to pour money into the sector, hoping it will become incredibly profitable as well. 2015 was another great year for “zombie ideas” in ed-tech. “Zombie ideas,” as economist Paul Krugman has described them, are those “policy ideas that keep being killed by evidence, but nonetheless shamble relentlessly forward, essentially because they suit a political agenda." Zombie ideas are sort of like SkyMall, which declared bankruptcy in January admitting that people don’t browse its catalog of crap any longer thanks to in-flight Wi-Fi. But then Skymall didn’t actually die, as it found new owners who promised to bring the magazine back to life and to airplane seat pockets. And remember, as VCU’s Jon Becker wrote way back in 2010, ed-tech has a lot in common with SkyMall. Some of the “zombies ideas” in ed-tech include the notions that technology facilitates cheating or that technology is a distraction and therefore should be banned in the classroom. (It is worth noting that the New York City public schools did lift their longstanding ban on cellphones this year. But it was hardly a fatal blow to that particular zombie idea.) Headlines appeared regularly throughout the year, stirring up panic about schools’ and students’ technology usage. From The Chronicle of Higher Education: “Facebook Addiction and GPA” From Salon: “Wi-Fi exposure may be worse for kids than we thought.” And some of the fears of ed-tech were warranted, as we witnessed data breaches, sexting rings, threats of violence (and real violence), and so on. One of ed-tech’s most powerful zombies, the learning management system, not only refused to die this year, but one of its makers, Instructure, had its initial public offering. (The latest on INST on the NYSE.) In related zombie news, Reuters reported in July that the most infamous LMS provider, Blackboard, was up for sale (again). But it doesn’t appear that there’ve been any buyers as of yet. The company continues to lay off employees, but alas it’s probably not a fatal blow for that particular monster. Also among the undead in 2015: virtual reality, which has seen renewed interest by the tech press, which continues to be pretty damn uncritical when it comes to reviewing new products or assessing the industry’s predictions. Google tried to convince everyone that its Cardboard viewer is VR and that the videos students can watch on the devices are akin to field trips. 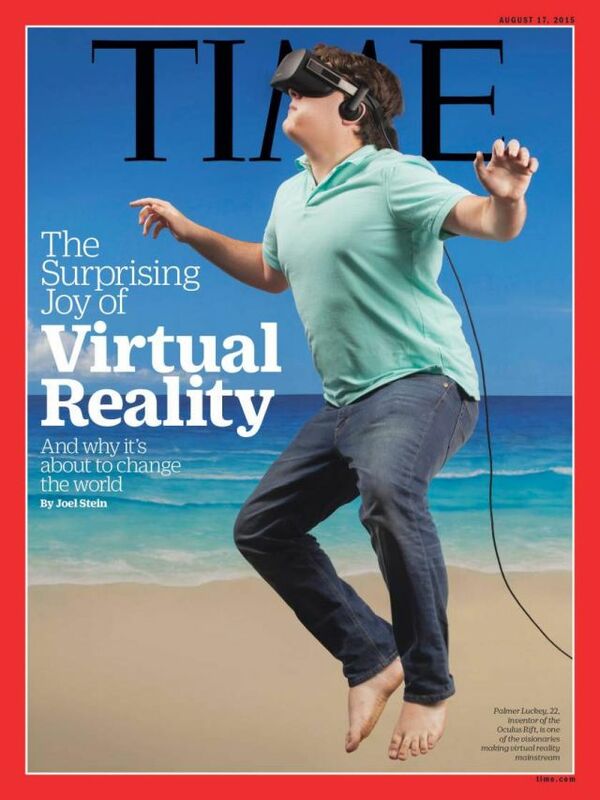 TIME insisted “Virtual Reality Is About to Change the World,” but then it put this photo on the cover of the magazine, surely setting VR back quite a bit. According to Second Life founder Philip Rosedale who’s still involved in various VR projects, “kids will one day go to school through a VR headset.” One day, man. One day. Meanwhile, Fusion’s Patrick Hogan took a tour of the abandoned college campuses of Second Life. In September, the OECD has released a report on computers and education, which found that – no big surprise – ed-tech isn’t really all that transformational, despite all the investor, media, and entrepreneurial frenzy. The report provides a first-of-its-kind internationally comparative analysis of the digital skills that students have acquired, and of the learning environments designed to develop these skills. This analysis shows that the reality in our schools lags considerably behind the promise of technology. In 2012, 96% of 15-year-old students in OECD countries reported that they have a computer at home, but only 72% reported that they use a desktop, laptop or tablet computer at school, and in some countries fewer than one in students reported doing so. And even where computers are used in the classroom, their impact on student performance is mixed at best. Students who use computers moderately at school tend to have somewhat better learning outcomes than students who use computers rarely. But students who use computers very frequently at school do a lot worse in most learning outcomes, even after accounting for social background and student demographics. The results also show no appreciable improvements in student achievement in reading, mathematics or science in the countries that had invested heavily in ICT for education. And perhaps the most disappointing finding of the report is that technology is of little help in bridging the skills divide between advantaged and disadvantaged students. Put simply, ensuring that every child attains a baseline of proficiency in reading and mathematics seems to do more to create equal opportunities in a digital world than can be achieved by expanding or subsidising access to high-tech devices and services. Last but not least, most parents and teachers will not be surprised by the findings that students who spend more than six hours on line per weekday outside of school are particularly at risk of reporting that they feel lonely at school, and that they arrived late for school or skipped days of school in the two weeks prior to the PISA test. One interpretation of all this is that building deep, conceptual understanding and higher-order thinking requires intensive teacher-student interactions, and technology sometimes distracts from this valuable human engagement. Another interpretation is that we have not yet become good enough at the kind of pedagogies that make the most of technology; that adding 21st-century technologies to 20th-century teaching practices will just dilute the effectiveness of teaching. If students use smartphones to copy and paste prefabricated answers to questions, it is unlikely to help them to become smarter. If we want students to become smarter than a smartphone, we need to think harder about the pedagogies we are using to teach them. Technology can amplify great teaching but great technology cannot replace poor teaching. But let’s be honest. There is a dearth of “great technology.” Most ed-tech is crap. And echoing the final post in last year’s review of ed-tech trends – #fail – 2015 has seen its share of ed-tech failures. There’s still no clear conclusion to last year’s massive LAUSD iPad fiasco, and while Pearson did agree to pay the district a $6.4 million settlement for the botched software implementation, we have heard no word on the FBI’s investigation or the SEC’s probe into the $1 billion deal. Apple wasn’t the only company that struggled with its hardware in schools this year. In April, Bloomberg wrote that “News Corp.s $1 Billion Plan to Overhaul Education Is Riddled With Failures.” (My favorite quote from the story comes from a seventh grader describing the Amplify tablets: “I think they’re evil.”) The company lost several key executives and laid off staff before finally being sold off by News Corp (to the old management team, including Joel Klein). I’ll detail more of these and other failures in subsequent articles in this series – particularly in “The Business of Ed-Tech,” which surely needs to be tempered from all the glee about this year’s record-setting investments. Because, yes, it’s worth noting (again and again and again) that “The Business of Ed-Tech” still includes all sorts of ridiculous marketing claims, made most notably this year by the likes of Knewton and Desire2Learn (but god, so many others as well). I write these posts because it’s important to me that we look more closely at the history of education, technology, and education technology. The news cycle tends to push things out of our minds so quickly. By December, we’ve forgotten what happened in March, let alone what happened a year, five years, ten years, fifty years ago. There were two very significant anniversaries this year – the 25th anniversary of the first one-to-one laptop program (at the Methodist Ladies’ College in Melbourne, Australia) and the 15th anniversary of the Maine Learning Technology Initiative, which made Maine the first state in the US to provide laptops to all middle-schoolers. I don’t think any major ed-tech publication (um, except this one) noted the date. Instead, there’s been the continuous clarion call for more data collection, more automation, more social and bio-engineering, more scientific management, and of course more disruptive innovation in education. These are the narratives loudly, frantically trying to shape the future. And this is why history matters – the long history and the short history of ed-tech that this blog tries to cover. We can’t accept an invented history – the invocation over and over, for example, of a “factory model of education.” Those of us who work in education and technology would do well to consider origins and trajectories and to think more carefully and critically about the past – that includes the recent past, the upgrades, downgrades, failures, wins, and trends of 2015.